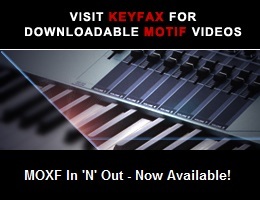 Viewing topic "MOXF GHS keys"
I had a chance to go to the shops to try out the new MOXF. Obviously, having owned MOX for barely a few months, the retiring of MOX and launching of MOXF made me feel like I should have known and waited for the MOXF. But that’s the thing with technology, they keep improving and you never know when is the best time to buy. The moment you buy it, a new product is already being designed and it’s definitely going to be better when launched. The MOXF keys have been improved. They are much quieter now. Yamaha is a company that has done tremendously well compared to the nearest competitor. While other companies cut back on quality and struggle to keep prices low and profits high, Yamaha seemed to have found the magic formula to keep making legendary products that people want to own and buy. One of the strongest points about Yamaha is that they keep improving. GHS keys (perceived by many to be “entry-level”, disputed by BM, of course) on the MOXF is much closer to the GH and GH3 keys now. The quality is superb. The noisy sounds have been reduced dramatically! I am not sure whether it’s just me or there are others who felt this difference. But for those who have not owned a MOTIF or MOX, MOXF is definitely going to be the machine for you. Interesting… and I have a similar report. I happened to be at a store yesterday that has both a MOX8 and a MOXF8 on the floor. With sound off, there’s was no doubt that the actions did not feel the same, and the MOXF8 felt better. Has Yamaha improved the GHS design from the older model to the new? Was it unit-to-unit variation that could have easily have occurred between two MOX8? Was it because the MOX8 had been on the floor for 6 months? I don’t know. I haven’t tested the MOXF8 yet, but I strongly believe that if Yamaha had made any improvement in the MOXF8 keyboard action, it would be advertised emphatically. Normally a new key bed would be advertised. But also, as part of marketing strategy, some improvements are kept silent and advertised in future products. MOXF in itself is revolutionary. So they feature the flash part. The MOX and MOXF actions are identical. All perceived differences could be due to global Velocity Curve settings. Since no mention was made if this parameter setting perhaps what you perceive as different action is purely a setting in Utility mode. Certainly if set differently the action would indeed be perceived as different, guaranteed! No, I am not talking about sound differences here. When I test out the key action on a keyboard, there is one thing that I do. And that is turn off the volume and play the keys. See and hear how they respond. A great action is one where the keys spring back in an authentic manner without excessive sounds. If you play on worn out keys, you will almost certainly hear a loud key return, something like “tuck” when the key is released. The perceived difference could also be that the MOXF is a new machine. Keys are always quieter when new. After thousands of repeated hitting, they start to become louder. And all these are played with the volume turned off, so that you can hear the mechanical sounds of the key return. Same here, my comparison was with power off. Yes - the sensory feedback loop is complex. Isolating one of your senses from others can be interesting and informative, but for most of us that’s not how it usually works in the real world. Bad_Mister having stated that the (2) actions are identical, I believe what you are experiencing is the inevitable decline of the action-assembly mechanics after extensive use. The weight of the “hammer” falling back onto the felt/foam stop strip over thousands of cycles causes a permanent divot, which results in a much harder ‘landing’ than the original fall-back cushion. This results in the ‘thunk’ heard upon release of the key. Think foam mattress after you have slept on it a few thousand times. This loud ‘thunk’ of the key upon let-off can be very annoying, and also helps create the perception of a sloppy action that some are reporting. Fortunately, it is relatively easy to correct...assuming you (As in the universal ‘You’) are a bit handy and get yourself a copy of the Service Manual for your particular instrument. The felt/foam stop is a continuous strip that runs the length of the keyboard action under the heavy wire “hammers”...which are activated by the keys being pressed and released. This is a pretty universal configuration in Yamaha weighted actions. It is the simple weight of these “hammers” that helps to replicate the weight of an acoustic piano action. By replacing this ‘felt stop’ strip (the newer ones don’t use felt at all… they are ‘memory foam’, which should have a much longer life without getting compressed and creating noise as quickly)...you can return your action to a very similar feel and quiet mechanical sound as it was when new! Once inside the keyboard, the entire action can be pulled out upon the removal of a handful of screws/bolts, and the strip can then be replaced. Talk about instant gratification...and the part is only about 30 bucks! Should take about an hour all-told to replace it (Yes, I have done this before), and you should end up with a dead-quiet (as in out-of-the-box-new) keybed. Obviously, if you do not feel comfortable doing this yourself you should retain a qualified technician to complete the repair. The main point I am trying to convey is that a solution to this condition exists, and it is not that intimidating. Note that your keyboard will most likely be out of warranty if this condition is present...unless you are playing it many hours each and every day. And even if it is still in warranty, this type of normal wear and tear will usually not be covered. Perhaps Yamaha have now included this “memory foam” on the newer GHS keybed? Perhaps that is why there was a difference. After all, as I read the post, the comparison in the store was with new (albeit demo) keyboards, not ones that had been used for some years. ...After all, as I read the post, the comparison in the store was with new (albeit demo) keyboards, not ones that had been used for some years. You might check with someone that works in an active retail musical equipment outlet...they will probably point out that popular “demo” gear gets “years” of use (abuse?) put on them in a matter of months! hmmmmm.. no offence, but I seriously doubt that! And I do know quite a few music store people (even owners) at a personal friend level. Did you write this or did Bad Mister write it? Did you perform the replacement or was that something Bad Mister did? Nobody at Yamaha knows anything about this....including Bad Mister. Did you perform this replacement of the felt strip with the memory foam strip? Yes, I wrote the discussion on the felt strip. The reference to Bad_Mister was simply that he called out the 2 actions as identical. Please be aware that I did this on my Yamaha P200 piano, which over MANY years of use had developed a very loud and clunky-sounding action. When I did it, I wasn’t 100% certain that the felt strip was the culprit...but indeed it was. My P200 has to date provided 17 years of continuous service, my XF8 about 6 years. As stated in the my original post, this strip is a pretty universal item in Yamaha Graded Hammer and Balanced Hammer Action keybeds. It is a strip that runs the length of the keybed, and is called a Stopper or Stopper Felt. Upon completing the “strike”, the weighted key falls back down onto this strip. Over many thousands of strikes, the weight of the key will eventually compress the strip in the location it falls on. Once overly compressed, the quality of the strip in the key-fall locations changes to a harder “cradle”, and...the result is loud, clunky action. The Service Manual for your particular keyboard will have disassembly instructions on how to get to this strip.